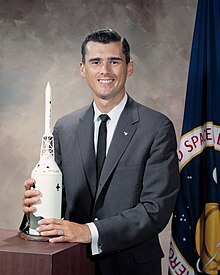 Roger Bruce Chaffee (February 15, 1935 – January 27, 1967) was an American test pilot and astronaut. He worked with the space program on the ground, helping astronauts who were flying in space. He talked to Gemini 4 during its mission, and NASA trusted him to fly special research jets to learn about how rockets worked. Chaffee died along with fellow astronauts Gus Grissom and Ed White during a test for the Apollo 1 mission at Cape Canaveral Air Force Station (then known as Cape Kennedy), Florida. ↑ "Astronaut Bio: Roger B. Chaffee". NASA. December 1997. Retrieved July 16, 2015.